For as long as time feathers have been a spiritual symbol of transcendence that has brought hope and comfort to all those needing divine assistance, finding a feather floating down from the sky is a sign that your loved one has made it safely home to Heaven. When you are feeling lost or missing someone you love, you may notice that feathers begin to appear all around you. They will appear in the strangest of places but at just the right time when you need to feel comforted. This is your loved one in spirit reassuring you and reminding you that they are close by. 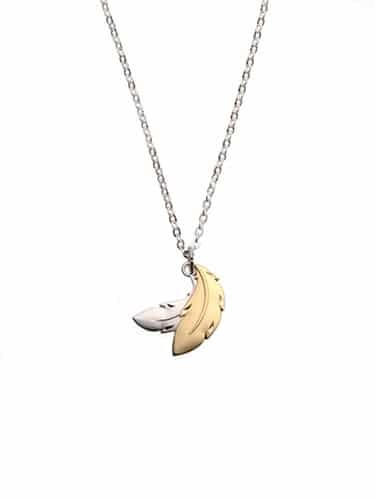 Feathers together is a special necklace for you to wear proudly to let Heaven and your loved ones know that you acknowledge and see the signs that they are sending you. You will notice that the same two feathers follow my logo throughout my work. The reason behind this is that feathers together symbolize that you are never alone; your loved ones are always with you. Just as the feathers separated and found their way back to one another, so will you and those you love that have passed away.